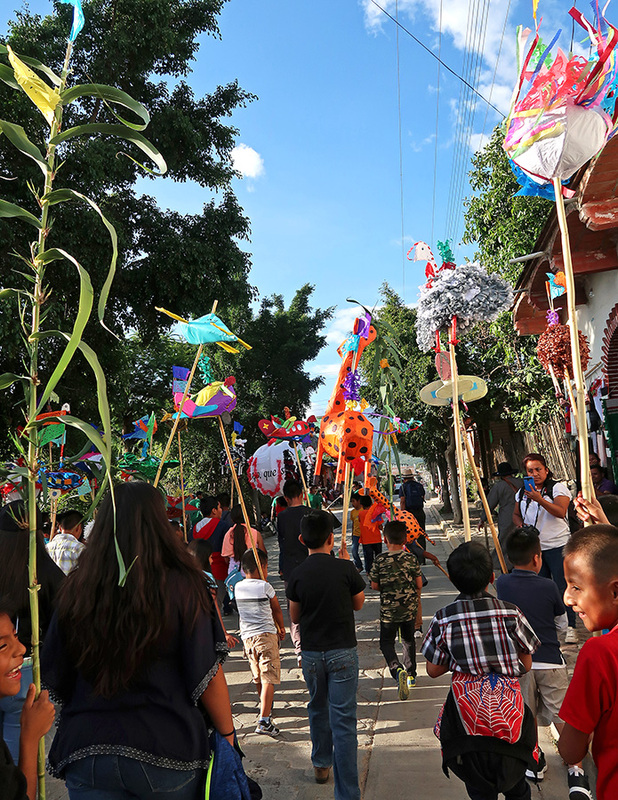 Yesterday, the village of Teotitlán del Valle and its Comité del Museo Comunitario (Community Museum Committee) welcomed the public to the inauguration of the first phase of the restoration of the archaeological zone beneath the Templo de la Preciosa Sangre de Cristo. 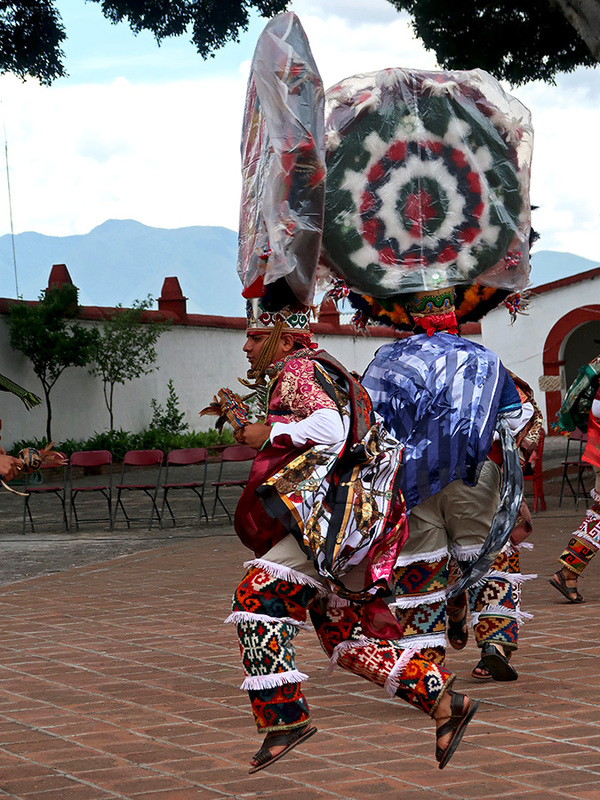 Before the arrival of the Spanish, the area had been a Zapotec ceremonial plaza. 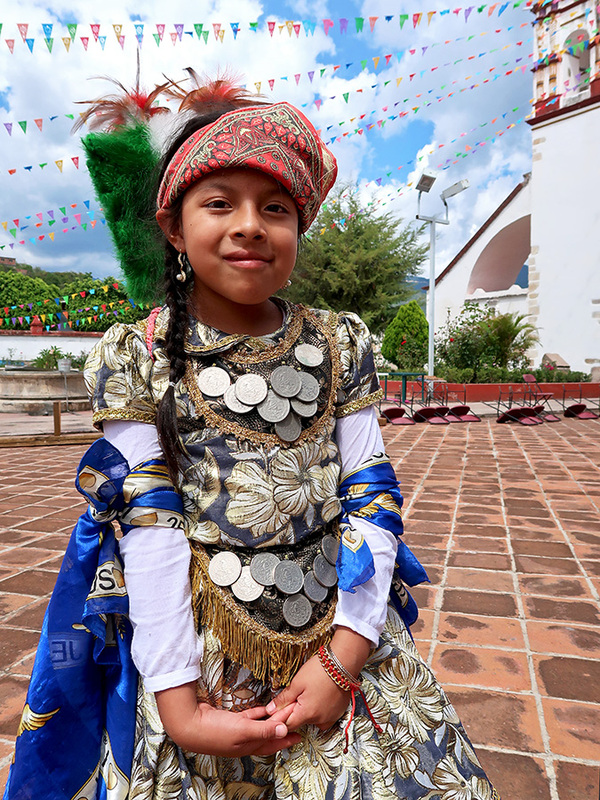 A little background: In 1553, Oaxaca’s Archbishop Albuquerque ordered the demolition of all Zapotec structures, including those in Teotitlán del Valle. 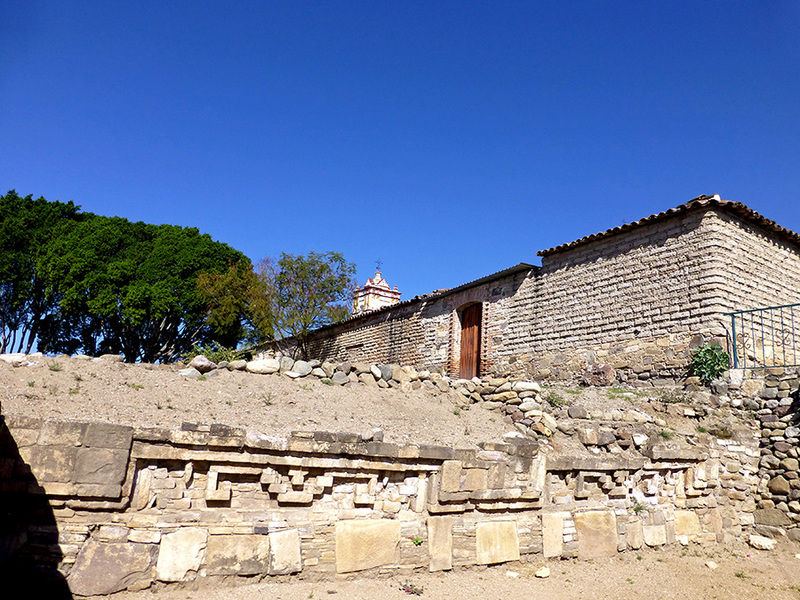 And, as was the practice of the day, in 1581 the Dominican friars began building their church atop the original Zapotec ceremonial complex. 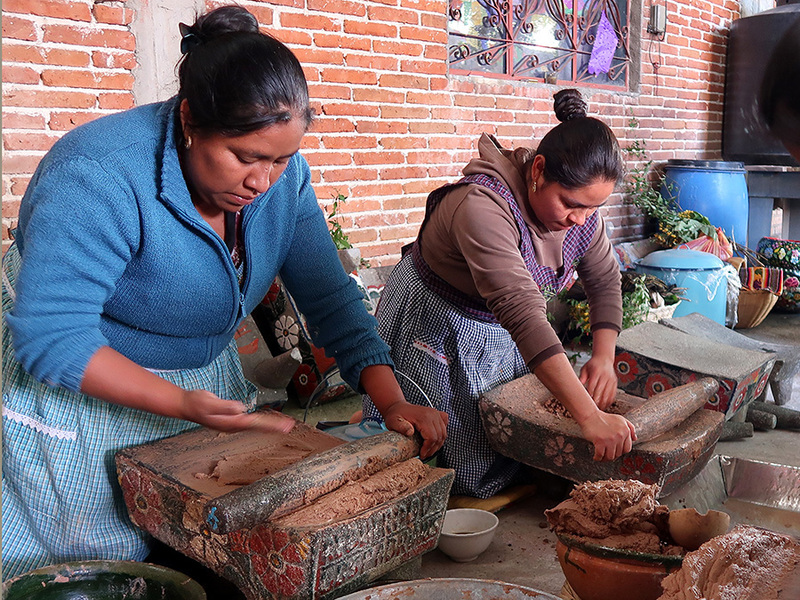 They scavenged building materials from the Zapotec site (some can be seen in the exterior walls of the church) and tried to erase all evidence of the rich and complex belief system that was already in place. 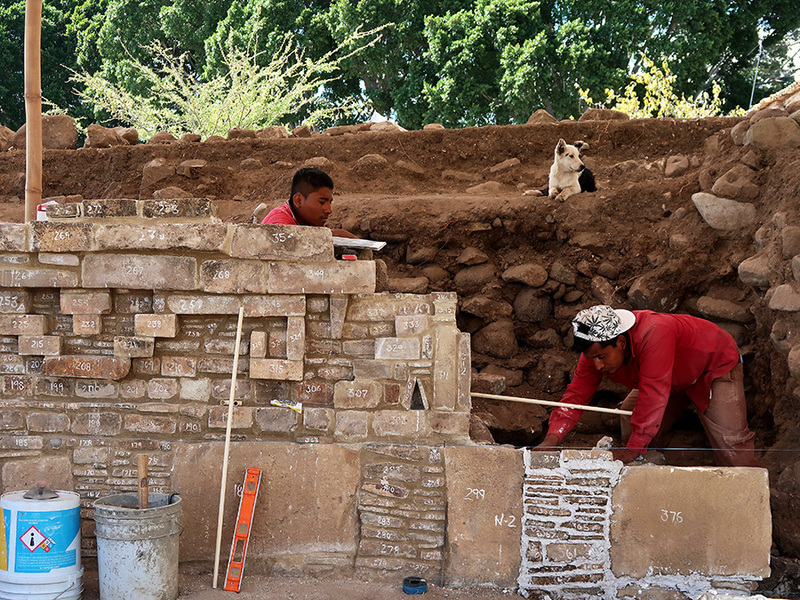 During: Sidewalk supervisor dog keeps an eye on the restoration work at the Teotitlán del Valle archeological site, February 2019. 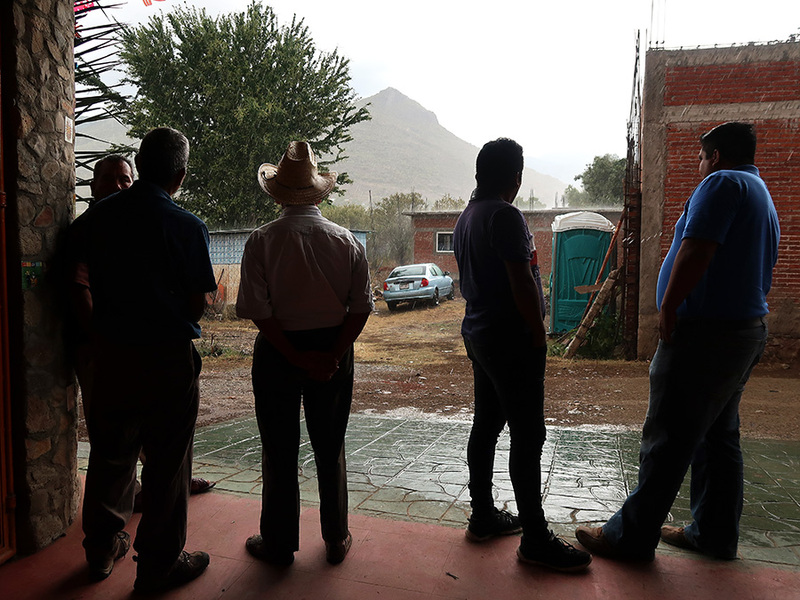 As regular readers of my blog know, I visit Teotitlán often and am always amazed at the construction projects that pop up — new buildings, additions to homes, and street repairs. 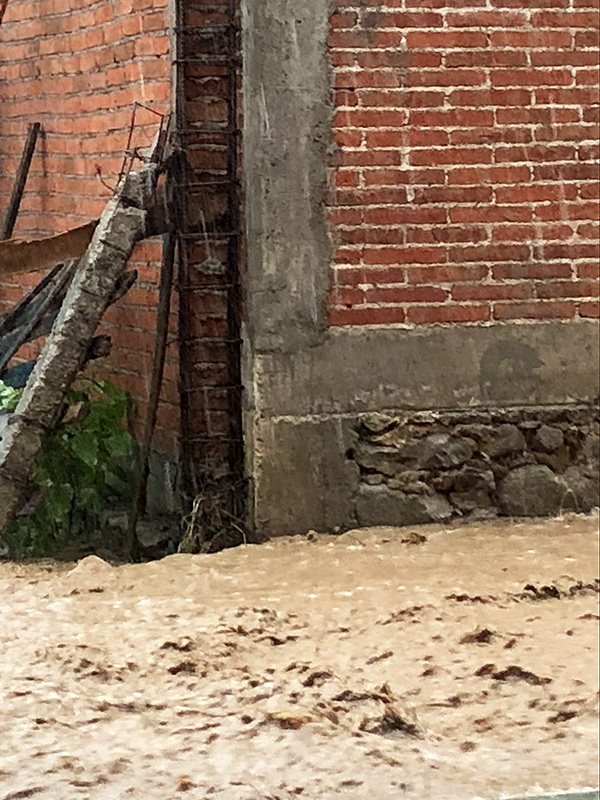 However, this past February, when touring out-of-town friends around Teotitlán, I was surprised to see work being done in the archeological zone. 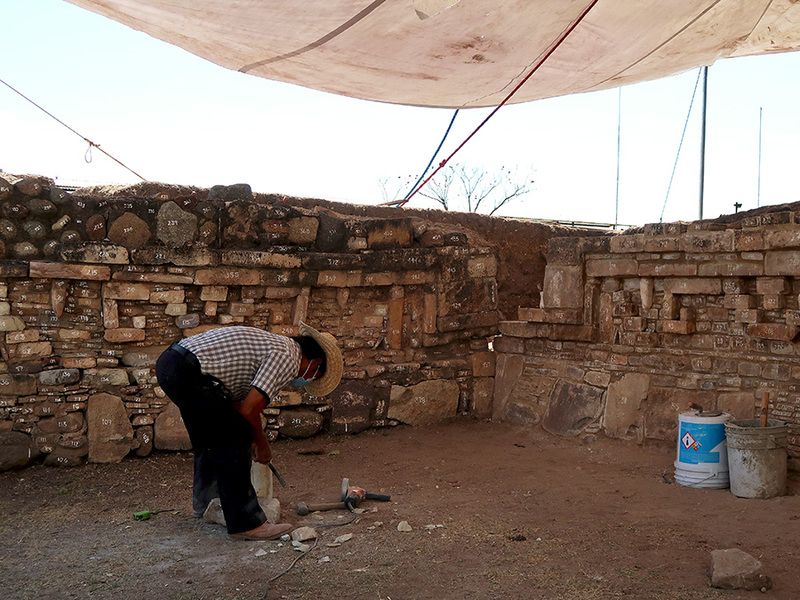 During: Teotitlán del Valle archeological site restoration, February 2019. Note the numbered pieces. 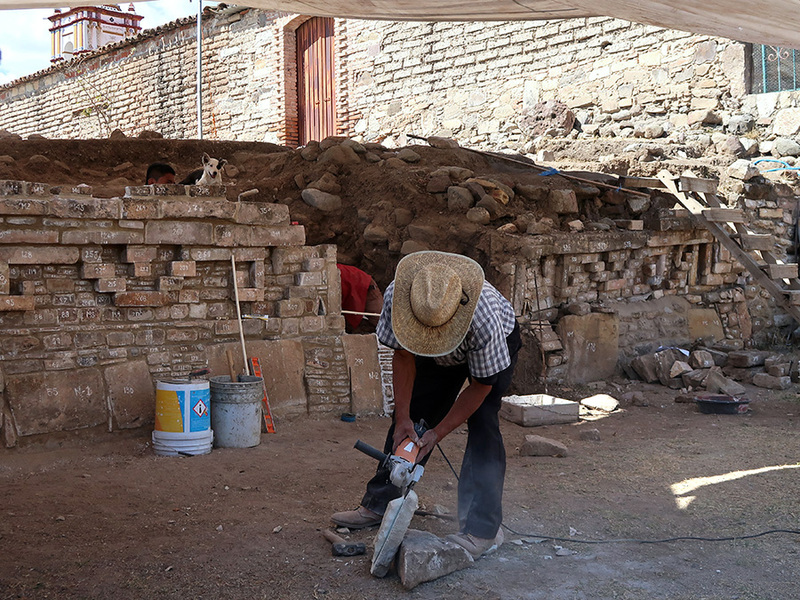 After three years of effort to obtain the necessary permits from the INAH (National Institute of Anthropology and History), the work on the restoration of the “basement” began in January 2019. 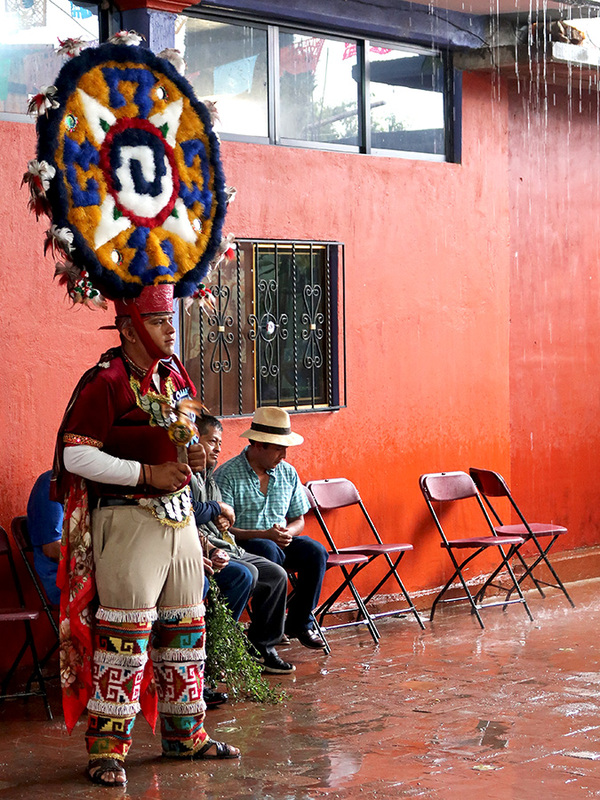 The end goal is to reclaim, rehabilitate, and restore the Prehispanic Zapotec ceremonial complex. 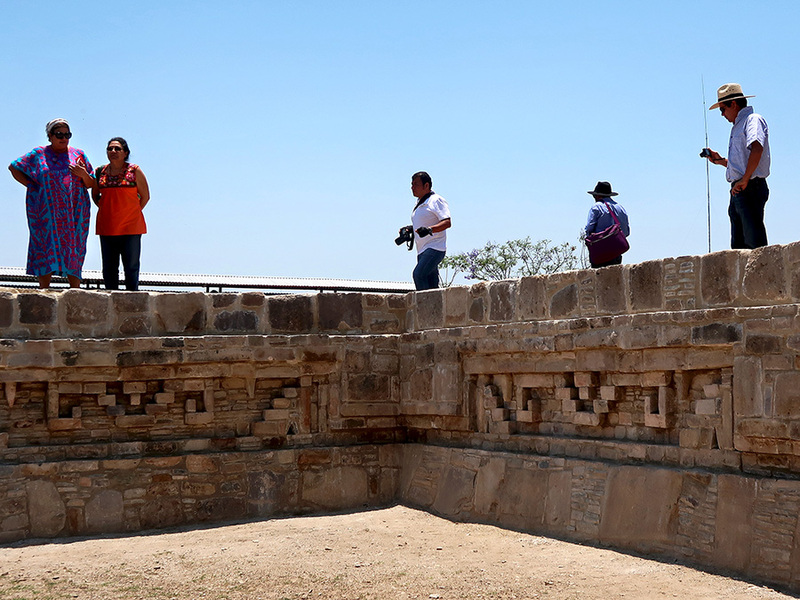 Teotitlán’s site is concurrent with nearby Mitla, thus the presence of grecas, the fretwork that characterizes the site 15 miles to the southeast. 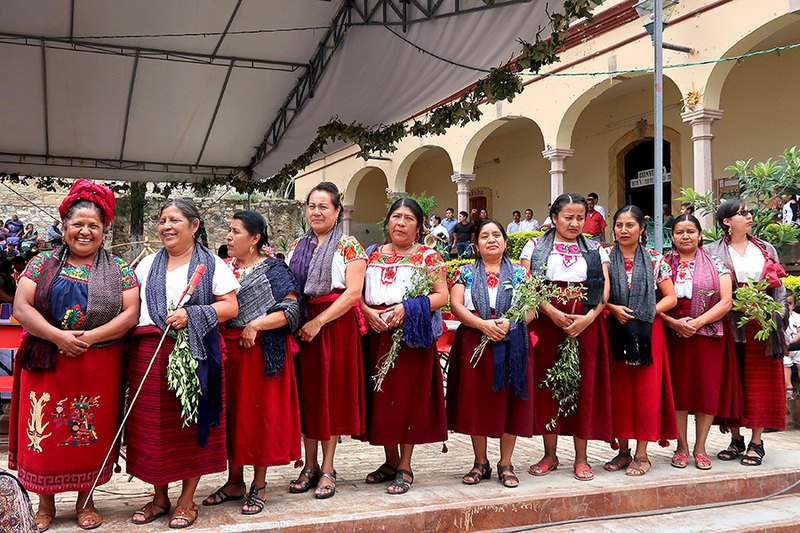 After: Teotitlán del Valle archeological site restoration inauguration day, April 22, 2019. I’m looking forward to what the next phase will reveal! 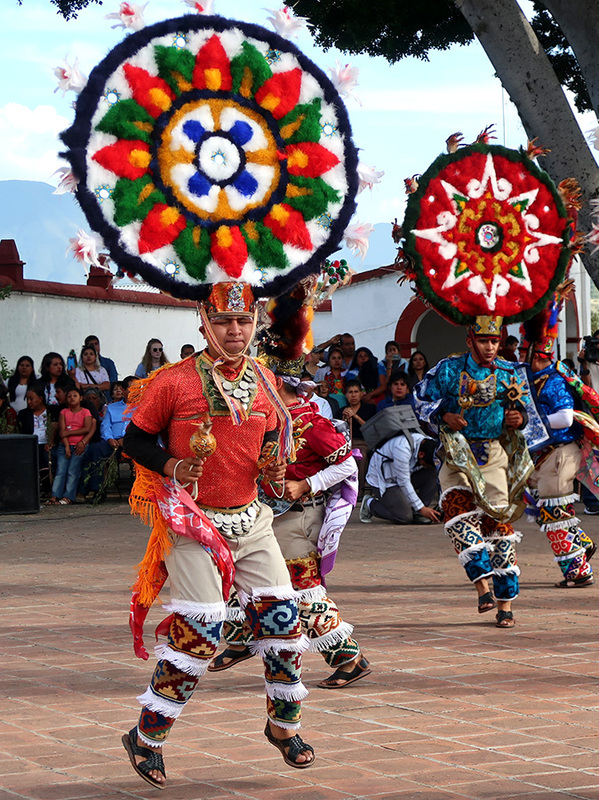 By the way, as is the custom in Teotitlán, this major civic event included not only speeches by gathered dignitaries, but also a procession, a performance of dances from the Danza de la Pluma, food, and a concert. 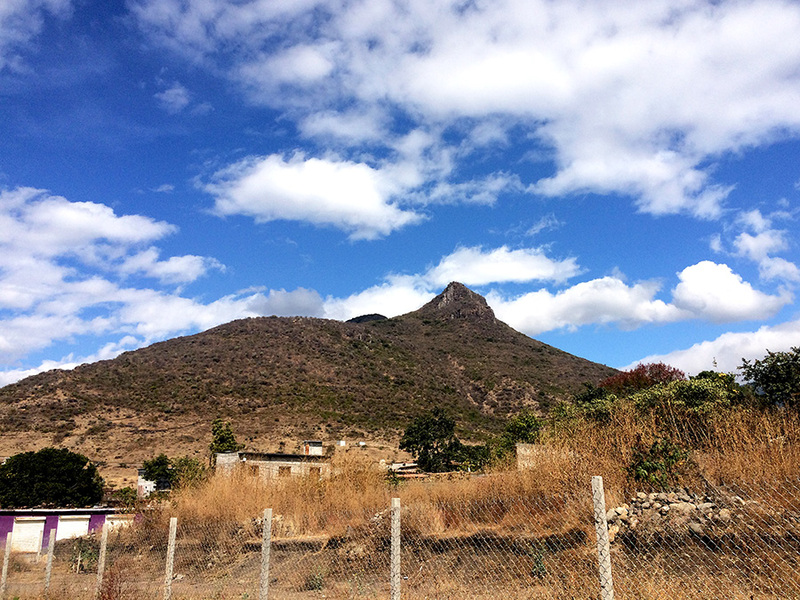 Looking back, it seems appropriate that I welcomed 2018 under the watchful eye of Cerro Picacho, Quie Guia Betz in Zapotec, that looms above Teotitlán del Valle — a mountain sacred to her people and where they make a pilgrimage to the top on Día de la Santa Cruz (Day of the Holy Cross). 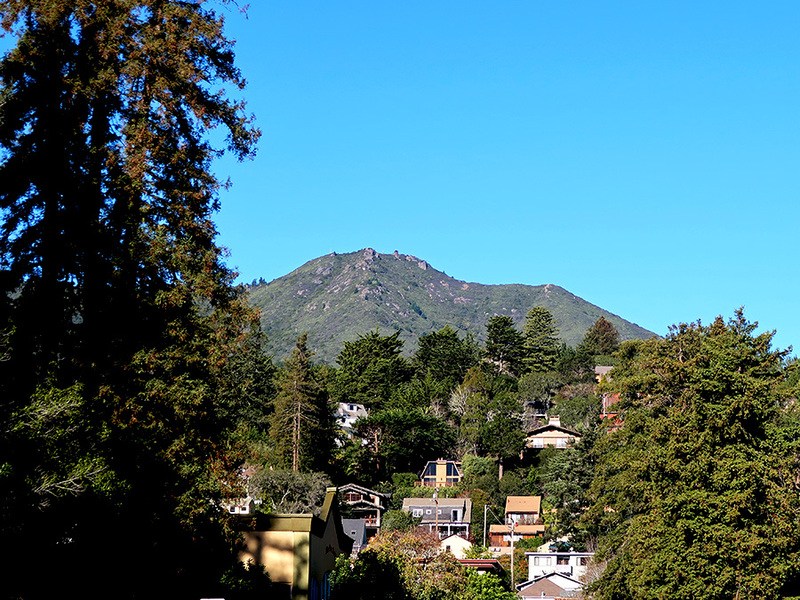 And then said farewell to 2018 in my Mill Valley hometown at the foot of Mount Tamalpais, the “Sleeping Lady” — mountain of my childhood dreams, teen driving lessons, and place of retreat. Two of my favorite places in the world — mountains that never cease to bring me a sense of peace, joy, and renewal. 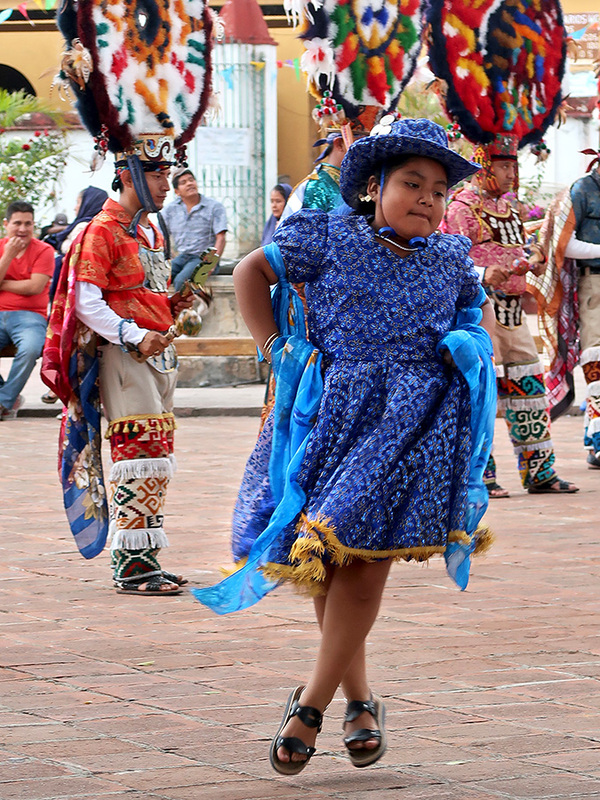 Yesterday, we said farewell to the Teotitlán del Valle, Danza de la Pluma Promesa 2016-2018 guys — and two little gals. 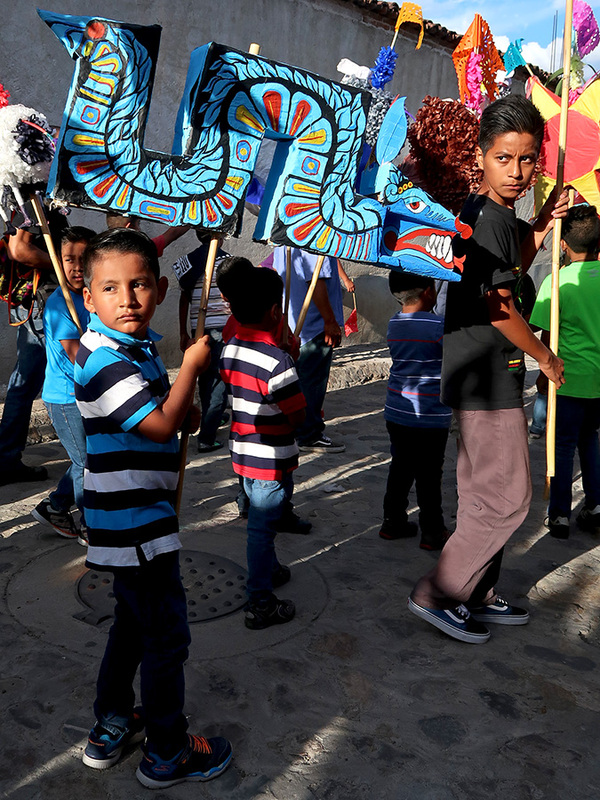 El Día de la Virgen de Guadalupe marked the end of this group’s three-year commitment to dance for their faith and community. 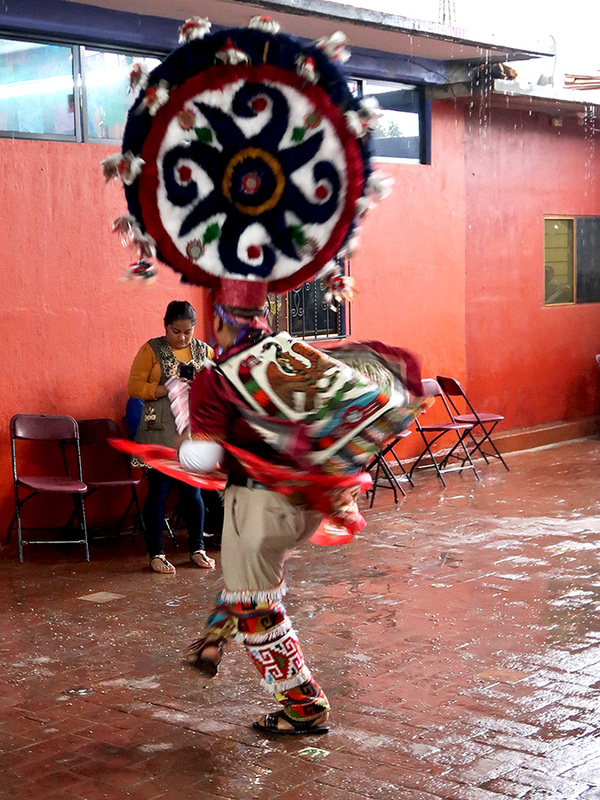 With well over one thousand family, friends, community members, and visitors watching, they danced their hearts out. And, after the skips, squats, twists, and leaps ended, there was nary a dry eye in the house. It was a fabulous night! 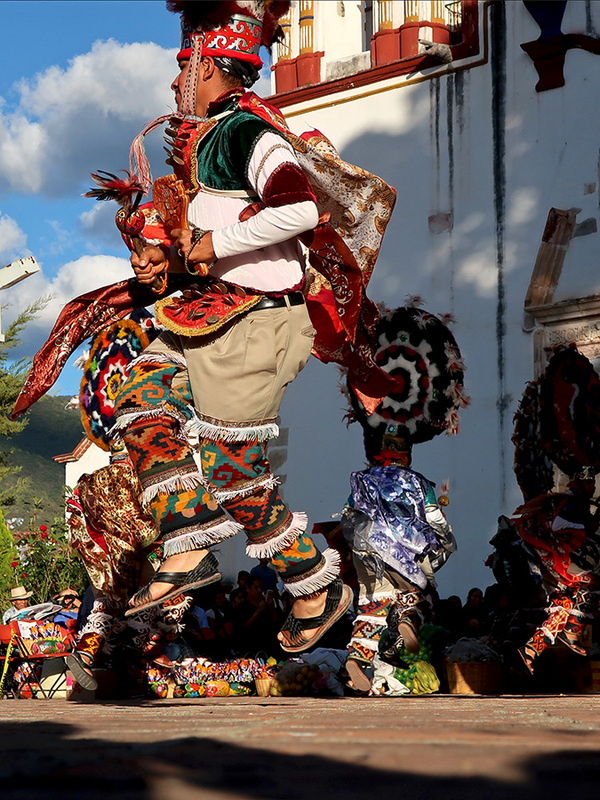 If you are in town… As background to the December 12, Fiesta a la Virgen de Guadalupe performance of the Danza de la Pluma in Teotitlán del Valle, blogger buddy Chris (of Oaxaca-The Year After fame) and I are again doing a presentation at the Oaxaca Lending Library. It will be on Tuesday, December 4 at 5:00 PM. 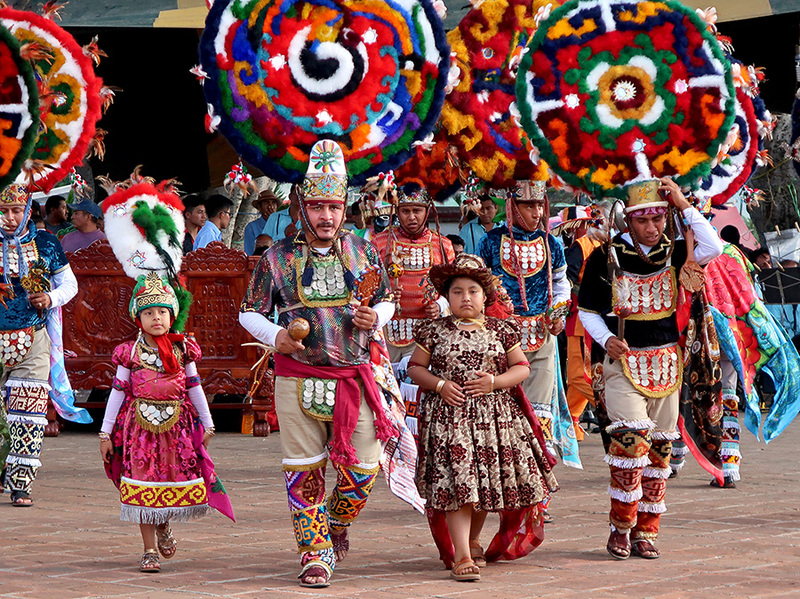 And, new this year: There will be very special guests! Alas, it’s not free. Besides memberships, presentations like this are what keeps the library afloat. The cost is 90 pesos for OLL members and 130 pesos for non-members. Reservations can be made using the library’s Online Store. Hope to see you on Tuesday! 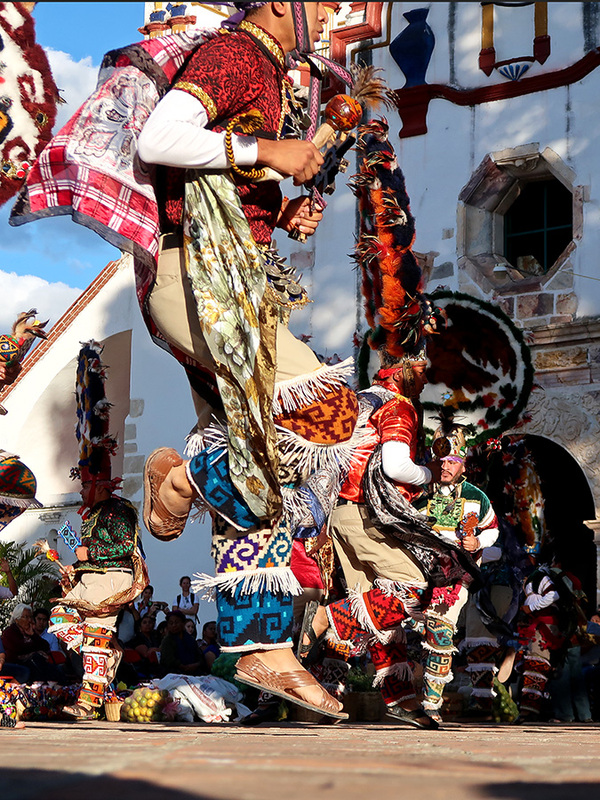 Late yesterday afternoon in Teotitlán del Valle — along with village officials, church committee members, 200 unmarried young women, Danza de la Pluma Promesa 2016-2018 dancers, players of the traditional teponaxtle (drum) and the chirimía (small oboe), pyrotechnicians, and two bands — children gathered. 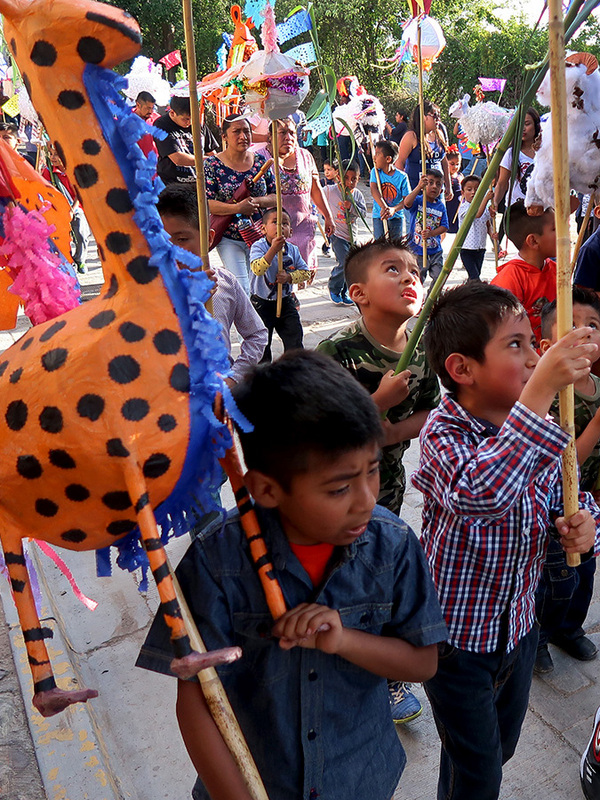 Boys came holding carrizo poles topped with mini marmotas (fabric globes), sheep, turkeys, giraffes, airplanes, and other images whose significance escapes me — though this year Quetzalcoatl made an appearance. 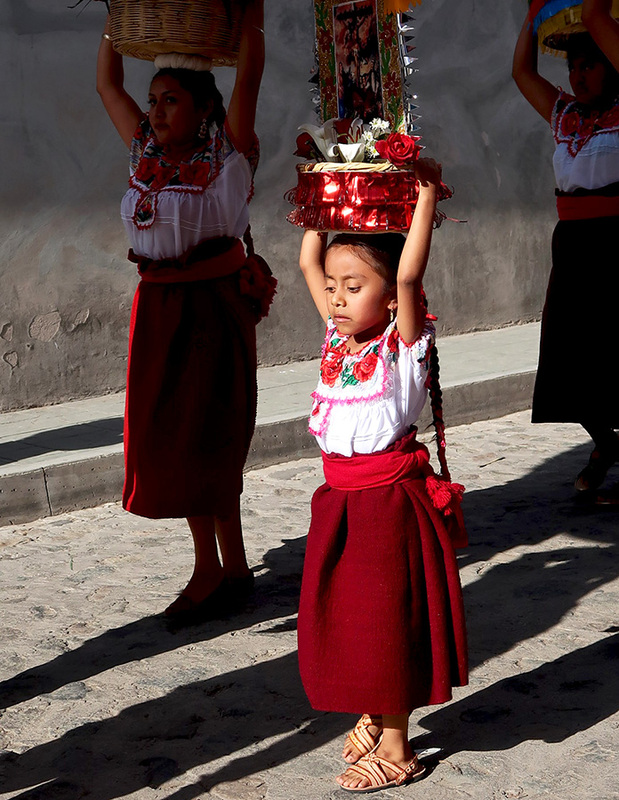 Little girls came wearing miniature versions of the traditional red wool enredo (wrap skirt) and embroidered or crochet blouses. 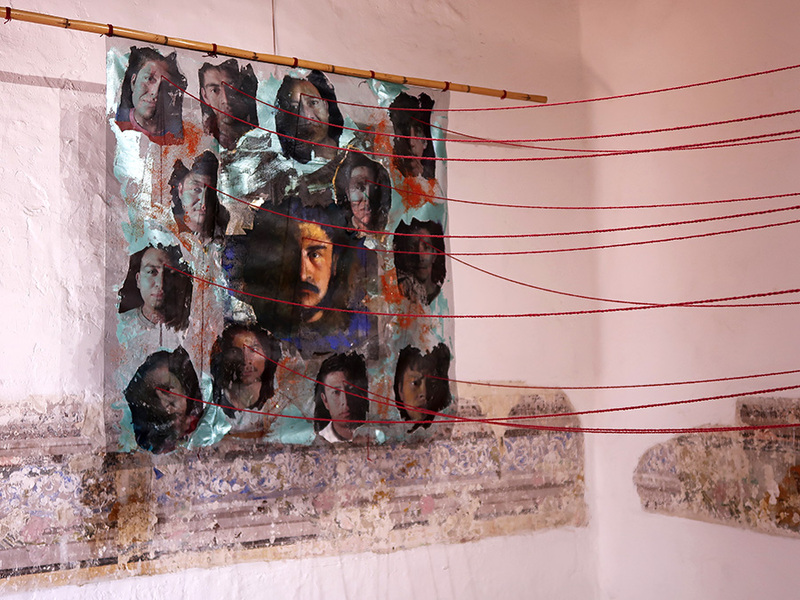 They assembled in the atrium of the church for the start of the *convite (special kind of procession) honoring the Preciosa Sangre de Nuestro Señor Jesucristo, the patron saint of the village and whose image, attributed to Oaxacan painter Miguel Cabrera, resides in Teotitlán’s church. 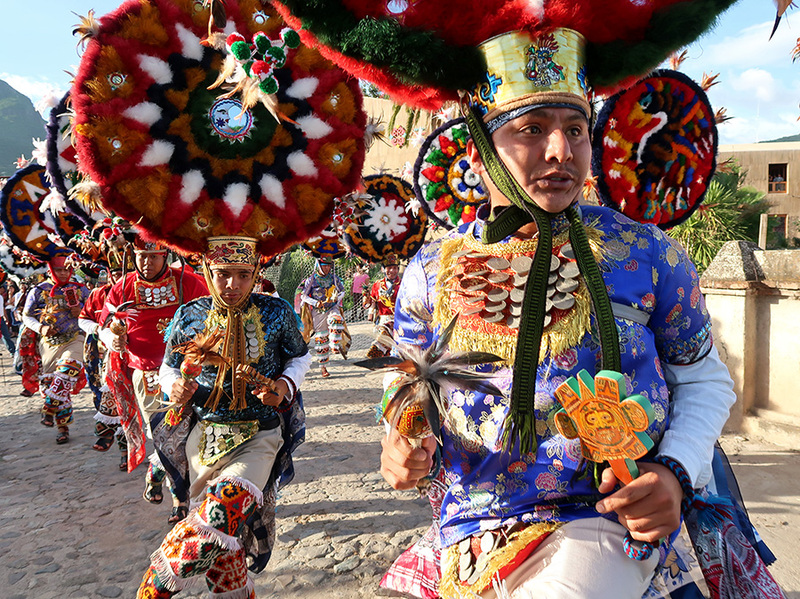 The procession wound its way from the atrium, through the principal streets (mostly cobblestone) of the village, and back to the atrium — approximately two miles (3.2 km)! Giving a group of boys long poles has the potential for high jinx, but most was limited to clever ways to evade overhanging tree limbs. 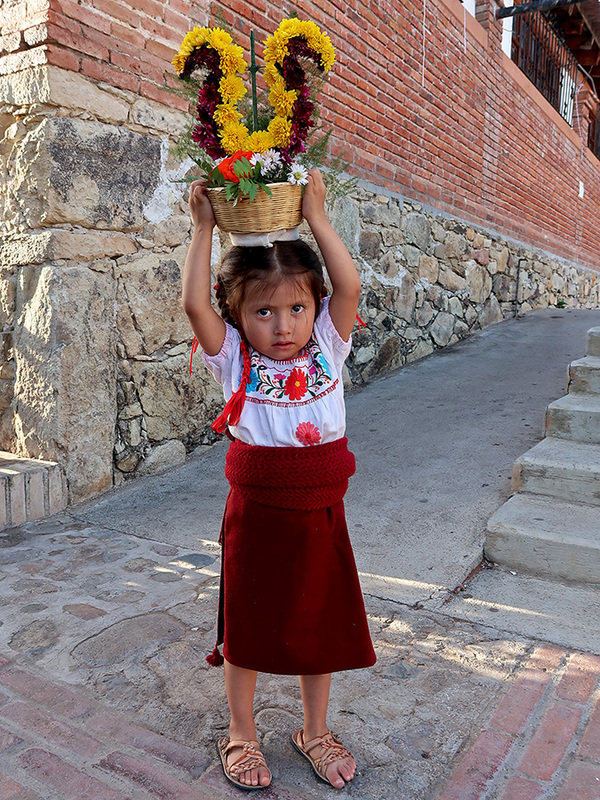 The littlest girls were beginning their years long conditioning in order to develop the arm strength needed to hold a canasta (basket) above their head for over an hour — SO much harder than it looks! 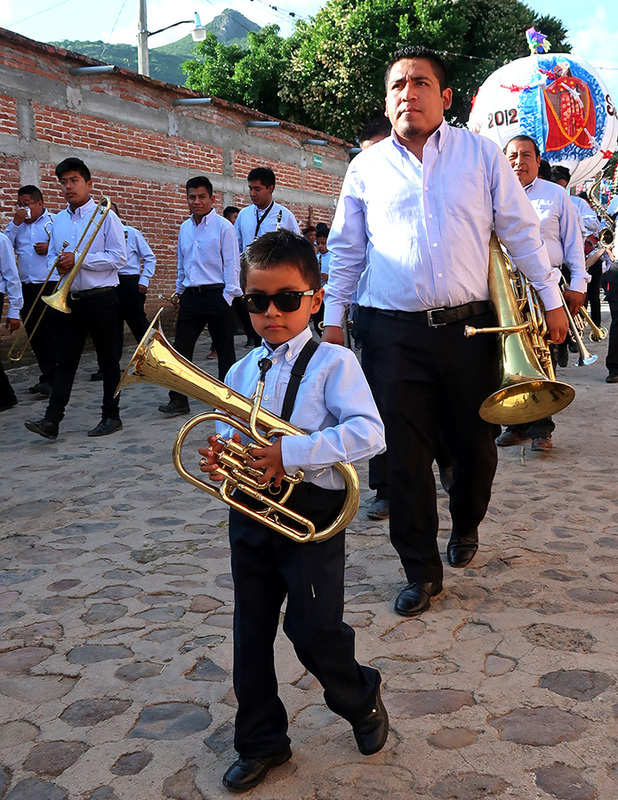 And, there were boys in the band — some already affecting a cool “Blues Brothers” look. 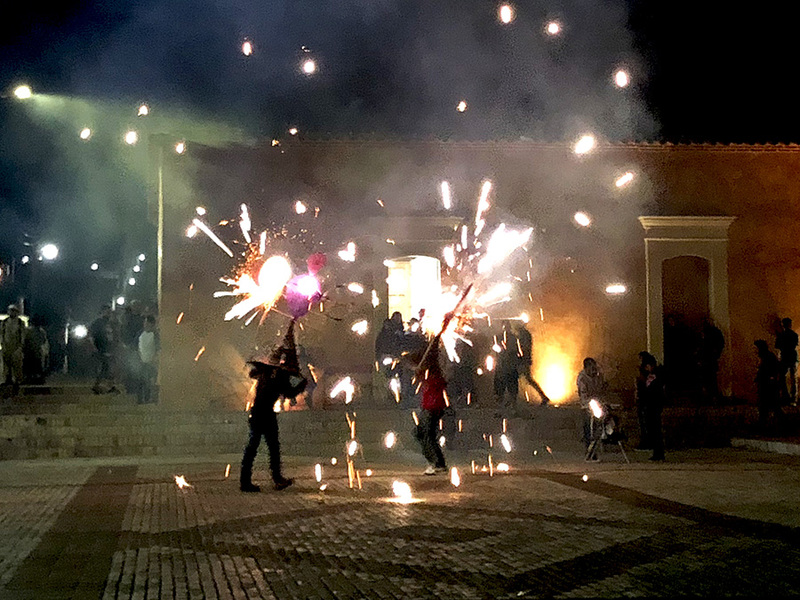 This was just the beginning of the festival — there will be the danzantes performing the Danza de la Pluma, fireworks (including toritos and castillos), and another convite. So, stay tuned for more to come. 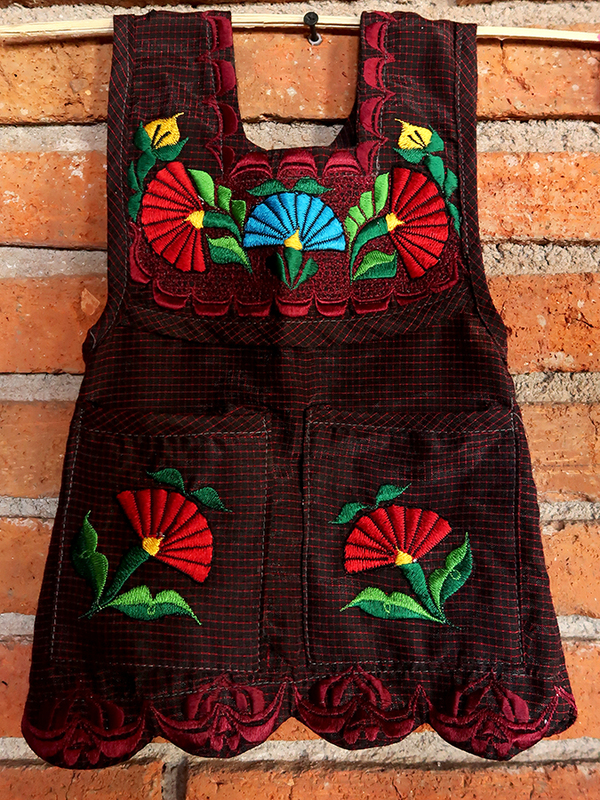 The lowly utilitarian apron has been elevated to an art form by the Zapotec women of the Tlacolula valley in Oaxaca. 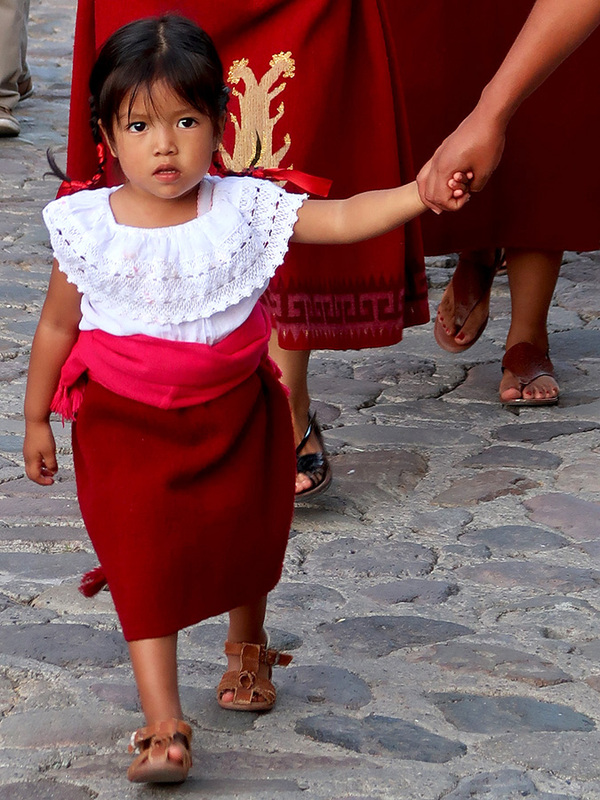 Worn every day, mandiles (aprons) are an essential and practical part of their traditional dress. Most women own several and take great pains to color coordinate them with the day’s attire. 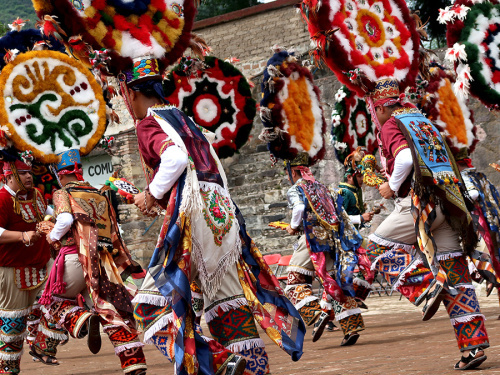 Fiesta honoring the Virgen de Guadalupe at the home of Fidel Cruz and Maria Luisa Mendoza, Teotitlán del Valle. 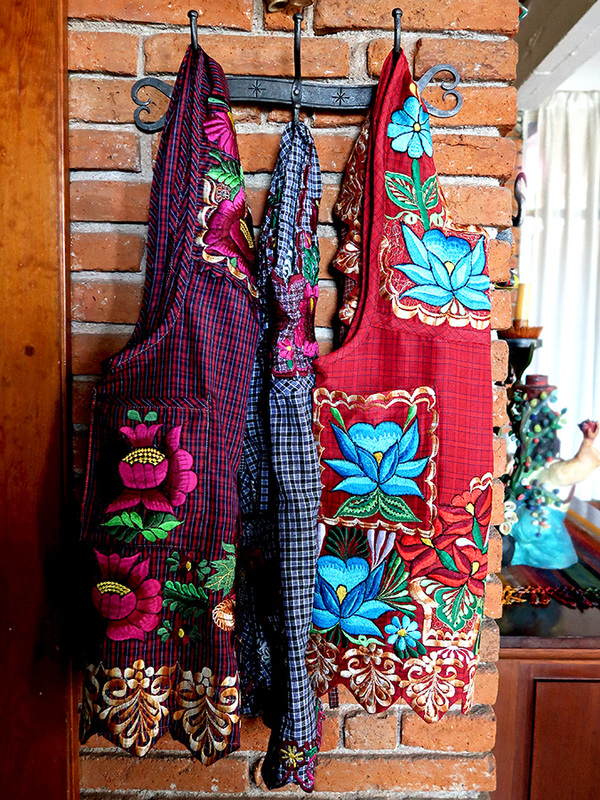 Plainer aprons are worn around the home. However, they don one of their “Sunday best” aprons for special occasions. 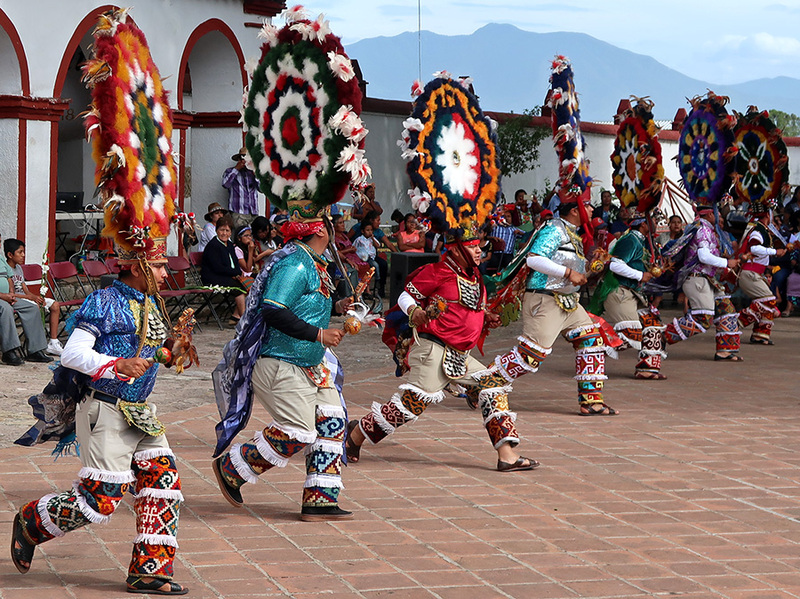 These are heavily embroidered and often have necklines and hems that are scalloped and, as a fashion statement, are frequently worn to the weekly market. 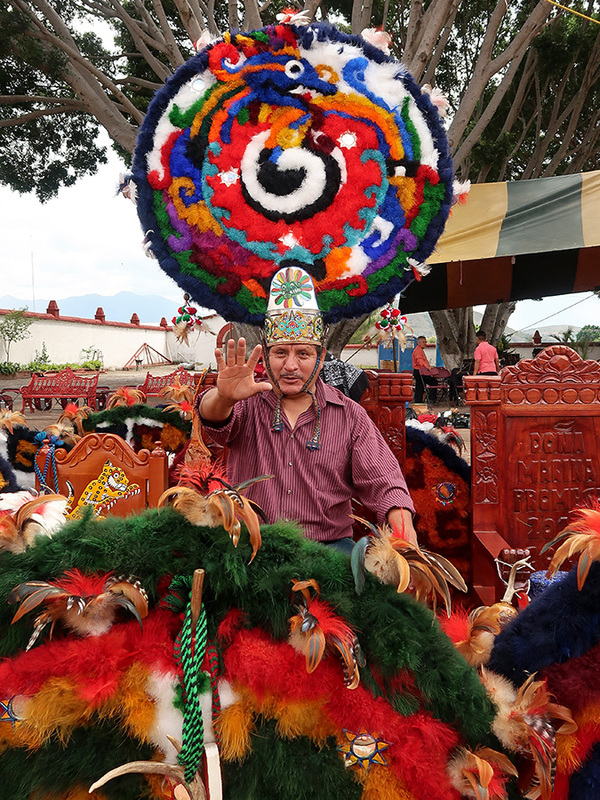 Vendor at the Sunday market in Tlacolula del Valle. 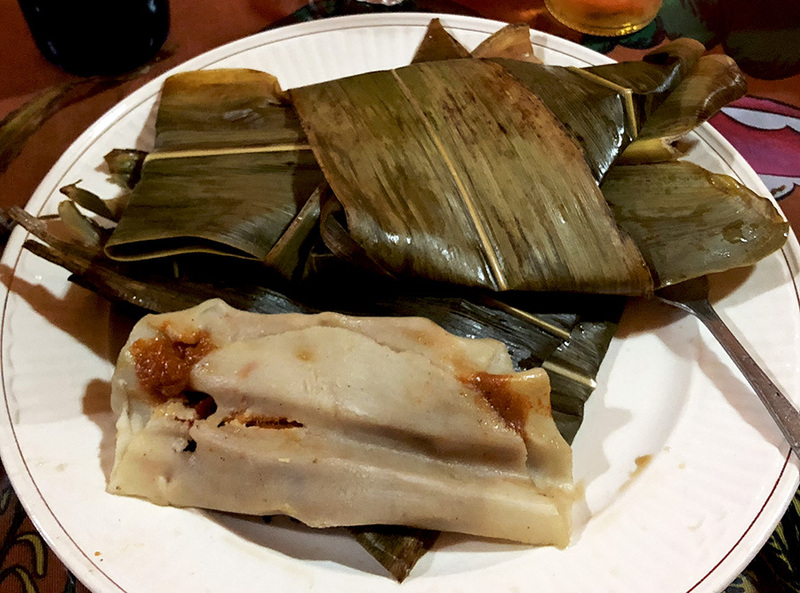 Mandiles are made of store-bought poly-cotton fabric, usually in a small plaid design. While “100% cotton” sounds more desirable to many of us, the blend is undeniably more practical. After all, who wants to iron when there is work to do and the temperatures are summery all year ’round? 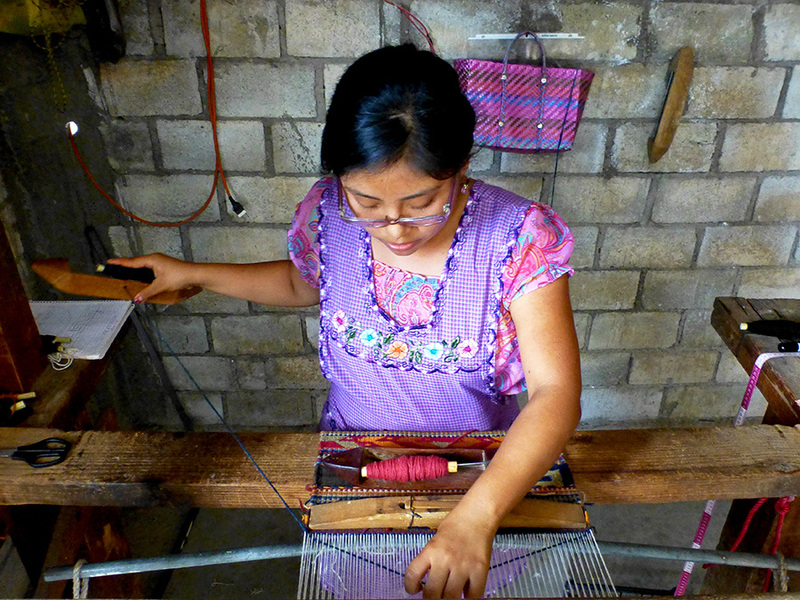 Andrea weaving in Teotitlán del Valle. 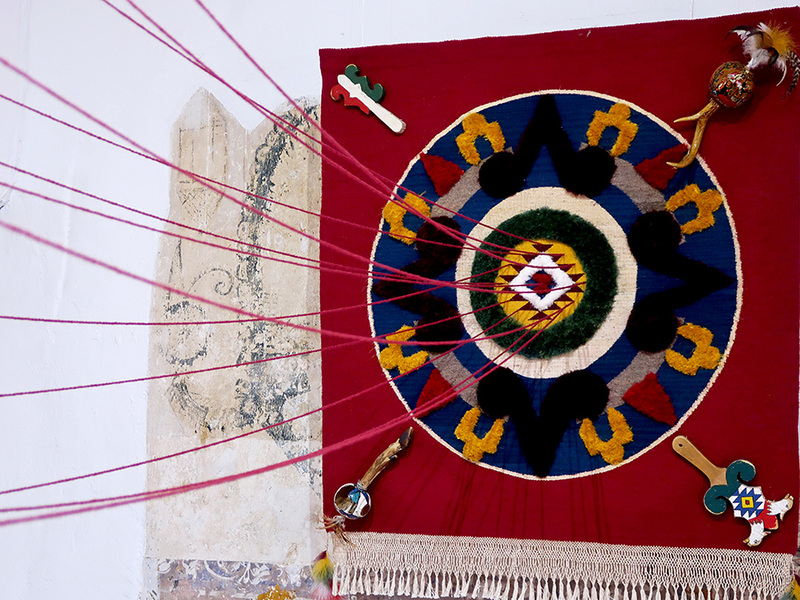 Even though the embroidery is done by sewing machine, the more elaborate designs can take from three to four days days to make. Aprons range in price from approximately 150 to 700 pesos. 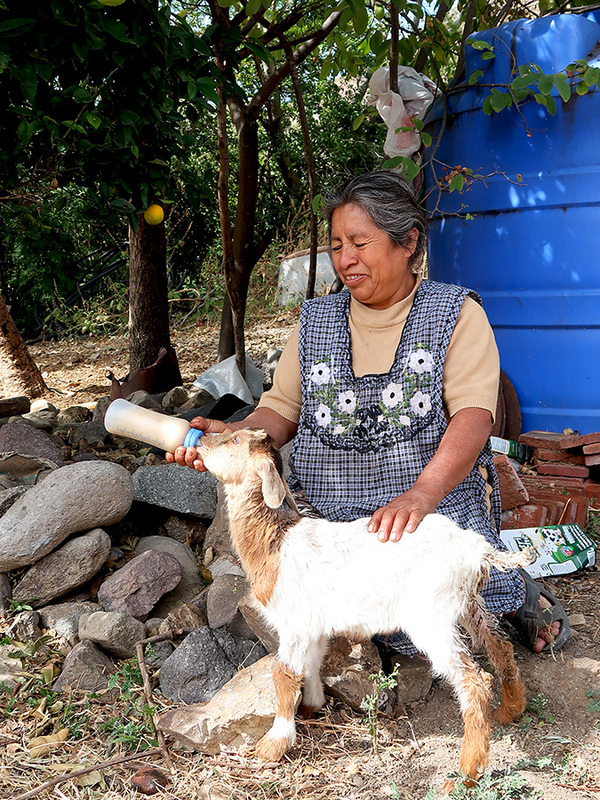 Leonor Lazo feeding a baby goat in Teotitlán del Valle. 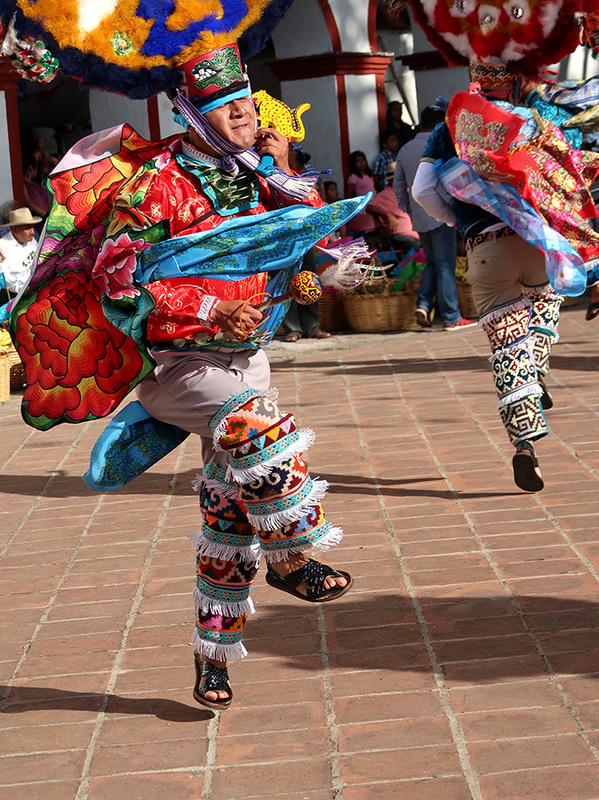 Given that, in addition to being practical, these are also a fashion accessory, it should come as no surprise that styles can vary from village to village. 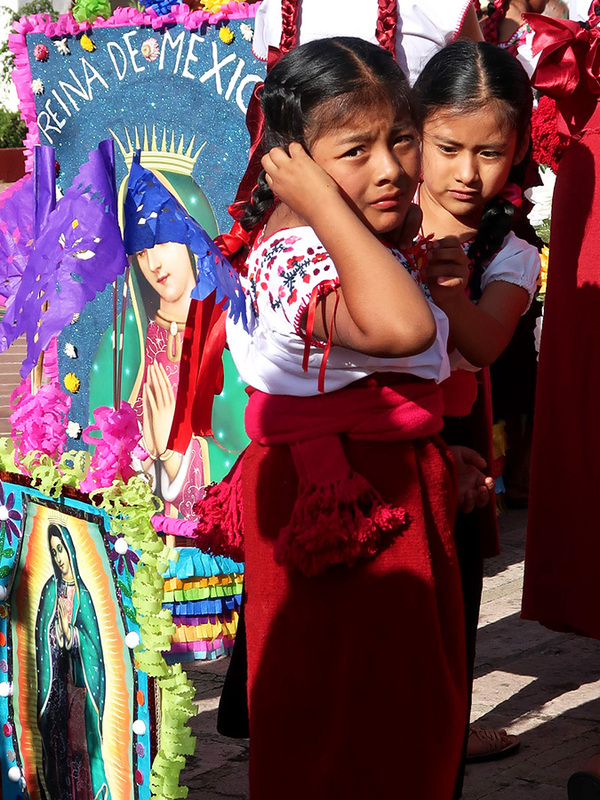 Young women from San Miguel del Valle attending a festival in Teotitlán del Valle. I grew up with aprons. My grandmother lived next door and could always be found wearing a “house-dress” and a pinafore style apron with front patch pockets. Some were plain, but many she decorated with embroidery. 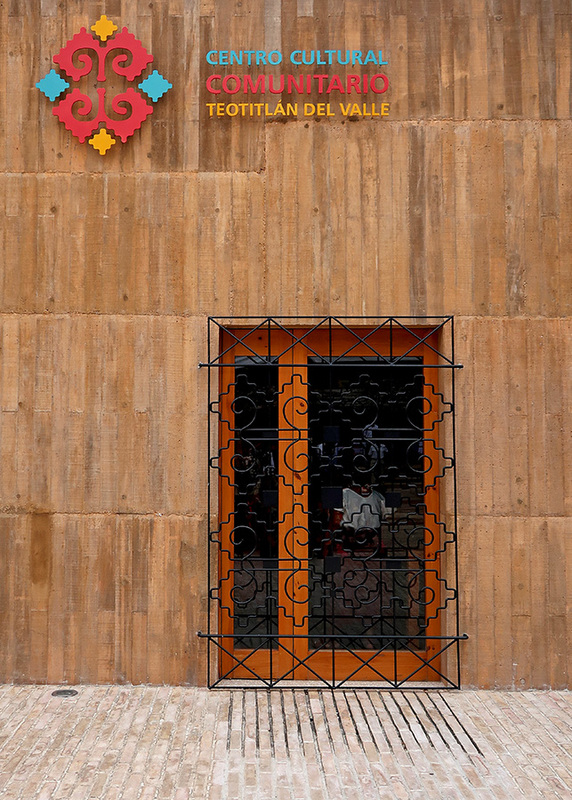 Thus the mandiles of Oaxaca spoke to me and I listened. 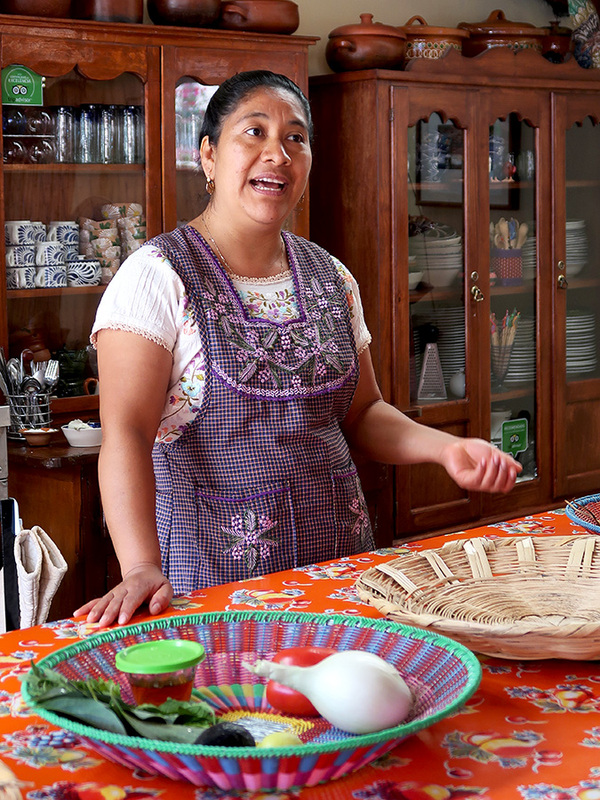 Reyna Mendoza speaking to her El Sabor Zapoteco cooking class. 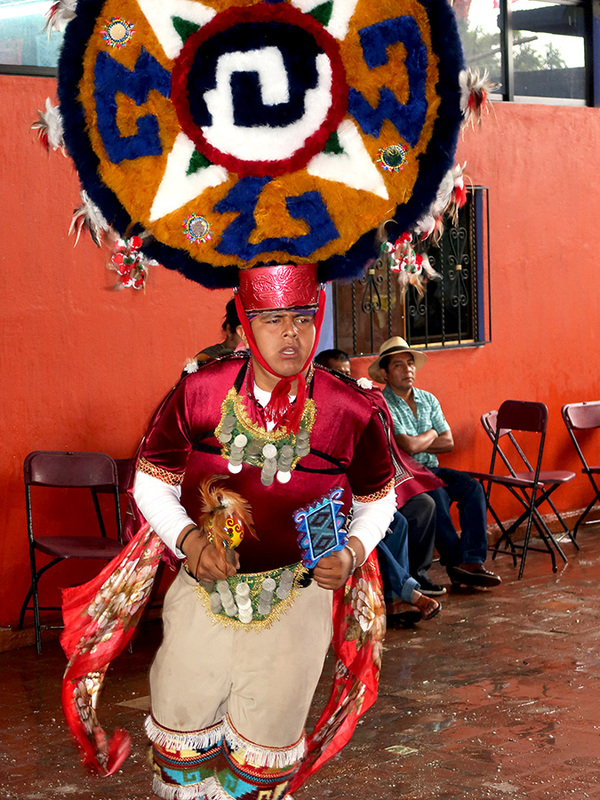 My first “Oaxaca” apron was a maroon plaid cobbler style with only a moderate amount of embroidery. After a year or two, it became so much a part of my home attire that I bought another in brown plaid. These are my workhorses and I wear them every day while cooking, cleaning, and even gardening. 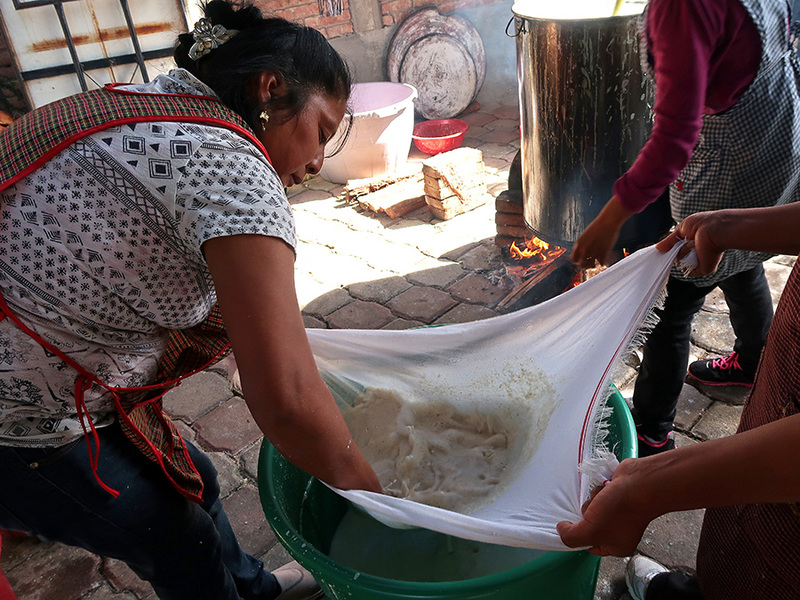 And, I proudly bring my own apron to cooking classes and make sure to pack one when I’ve been invited to a fiesta in Teotitlán del Valle — putting it on to help clear tables. 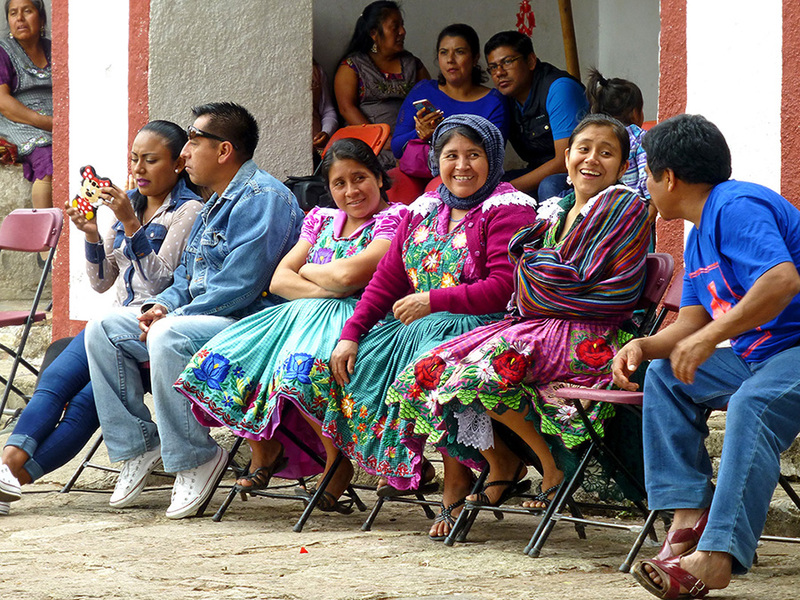 I always get smiles from the women (and some of the men, too). 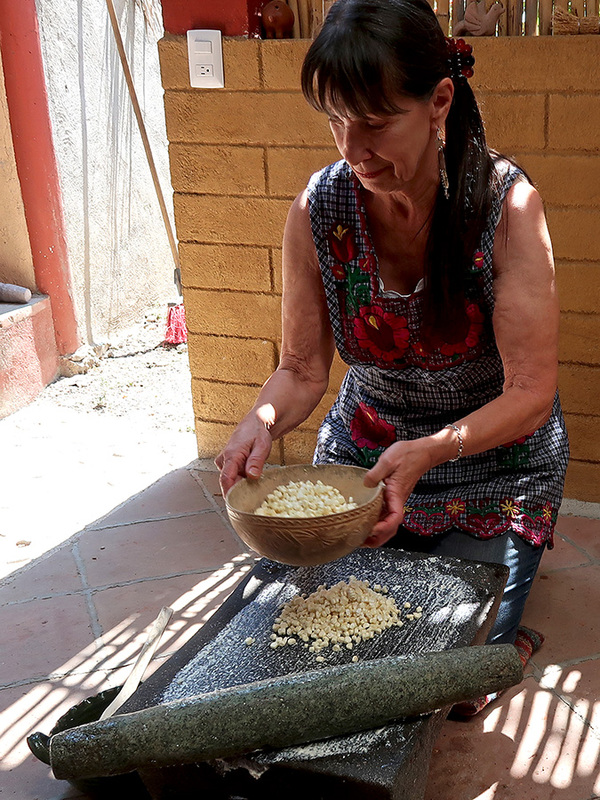 Me, the metate, and maiz at El Sabor Zapoteco cooking class in Teotitlán del Valle. 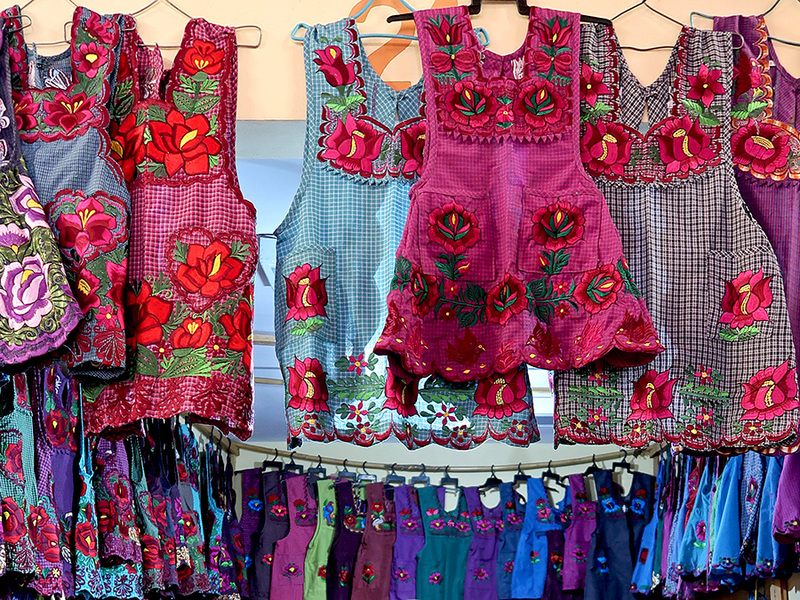 However, after countless Sunday market day trips to Tlacolula de Matamoros, not to mention, spending a lot time over the past several years in Teotitlán del Valle, I couldn’t help but be inspired by the fashion statements women, both young and old, were making, so I bought a slightly more elaborately embroidered pinafore style and then another and another. Three of my mandiles; the red is the newest. I even dared to wear one recently in New York at my granddaughter’s first birthday party. With children ranging in age from six weeks to six years, I thought it was a very practical fashion statement on my part. And, guess who got one for her birthday? Birthday present to my granddaughter — a toddler-size mandil. 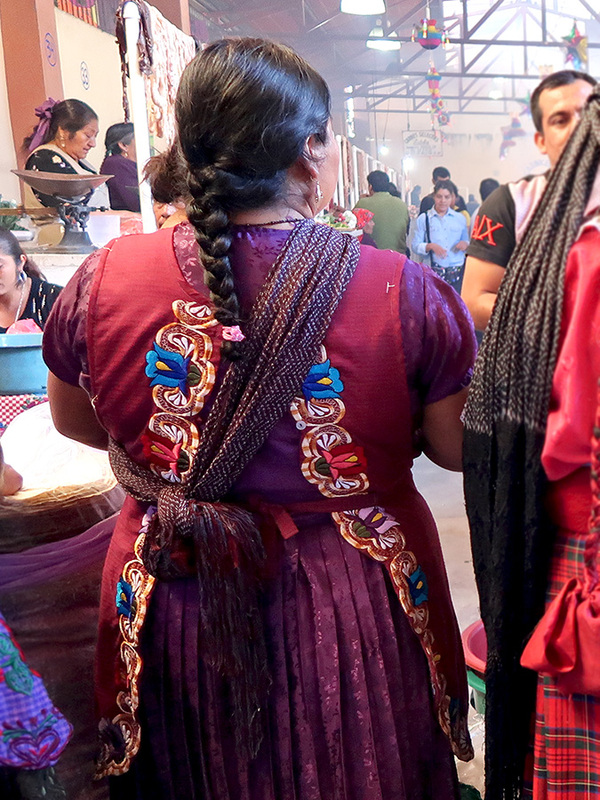 A good place to check who is wearing what style of mandil is at Tlacolula’s Sunday market. And, should you want to buy one for yourself and/or give one as a gift, there are at least eight apron stalls at the back of the market on Sundays. 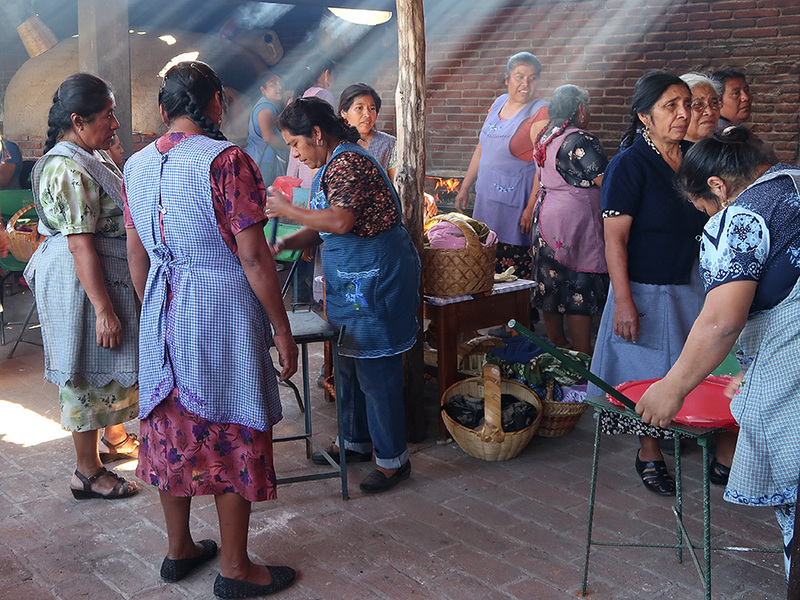 Apron stall at the back of the Tlacolula de Matamoros market. 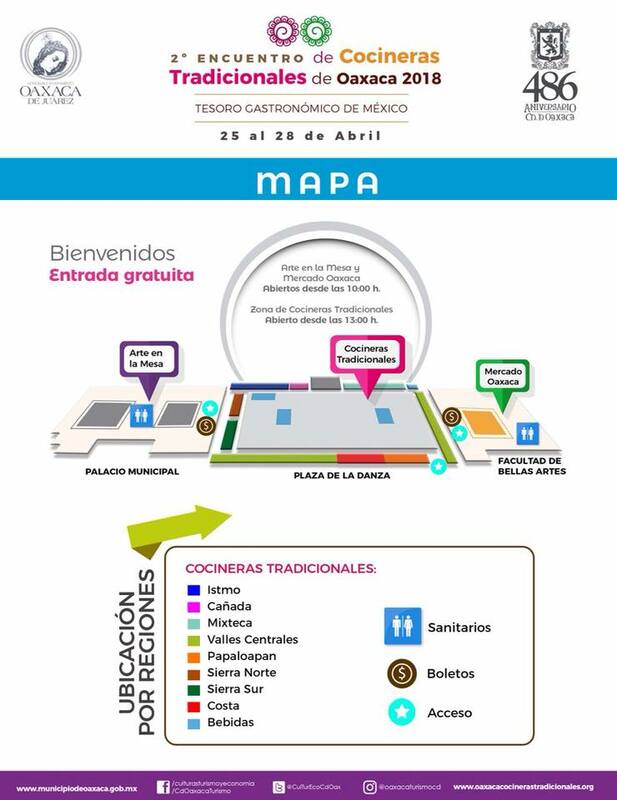 Beginning Wednesday, April 25, there will be a four-day gathering of cooks in the Plaza de la Danza — and not just any cooks! 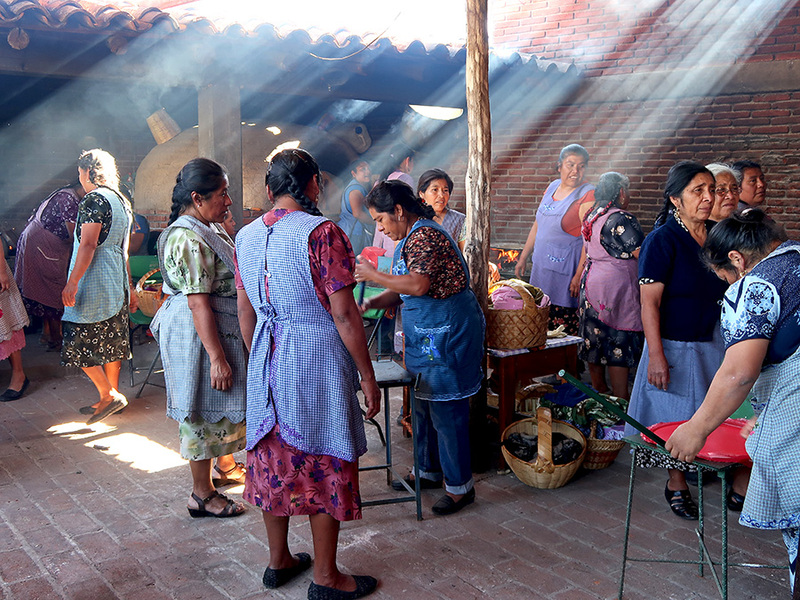 The second Encuentro de Cocineras Tradicionales de Oaxaca will be hosting 85 traditional female cooks from Oaxaca’s 8 regions, representing 10 ethnic groups and 58 communities. 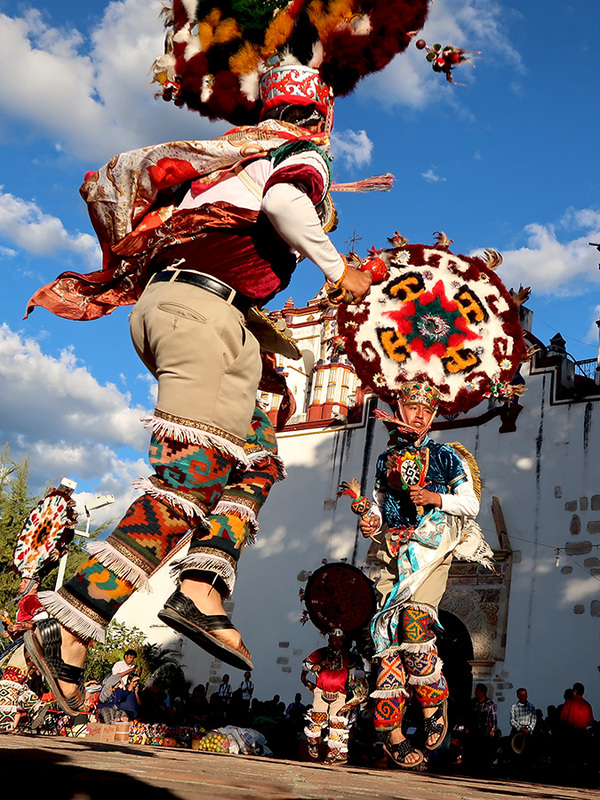 They will be offering more than 300 dishes, 30 desserts, 20 traditional beverages, and 70 varieties of tamales for sale from 1:00 PM – 9:00 PM each day in the Plaza de la Danza of Oaxaca. 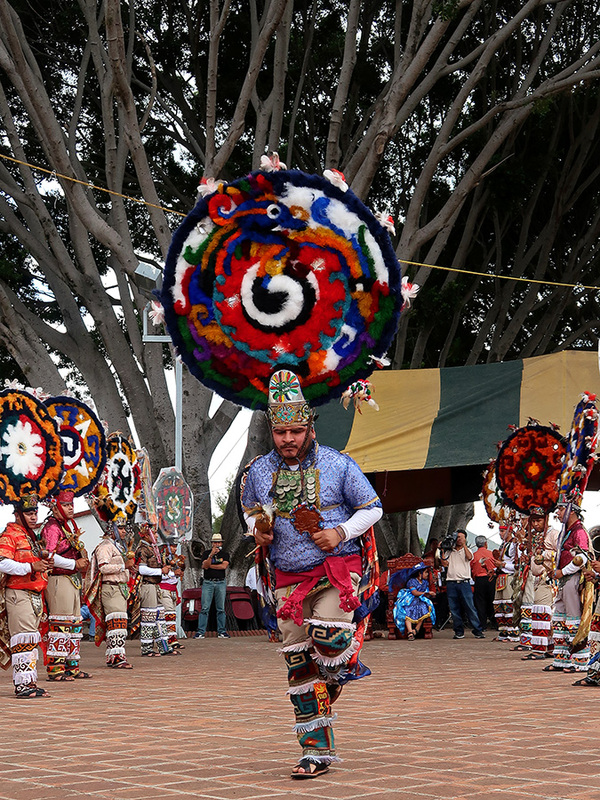 In addition, there will be cooking demonstrations, lectures, and regional music and folkloric dancing to entertain diners. 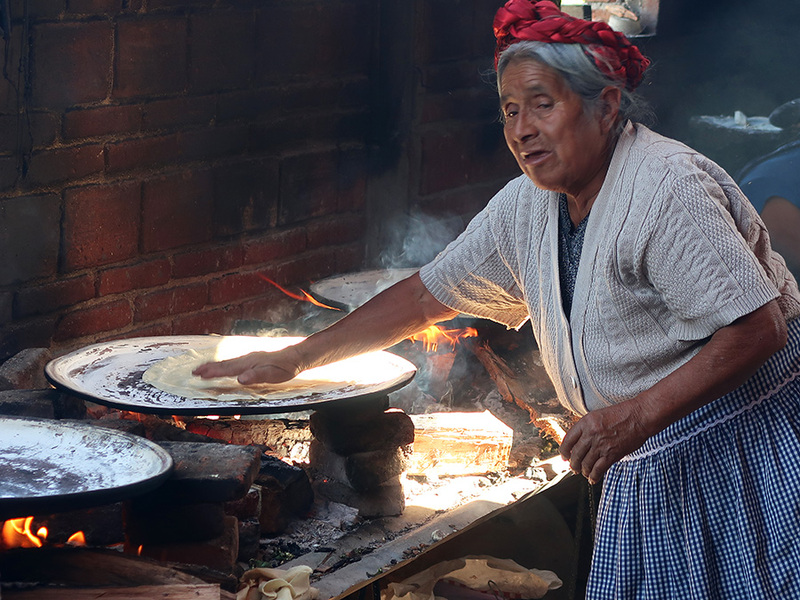 The Cocineras Tradicionales de Oaxaca Facebook page explains that they are an organization that promotes the ancestral tradition of Oaxacan cuisine carried out by its women — an inheritance transmitted from grandmother to mother and from mother to daughter. And love and reverence for the knowledge and experience continues to be passed down through the generations. 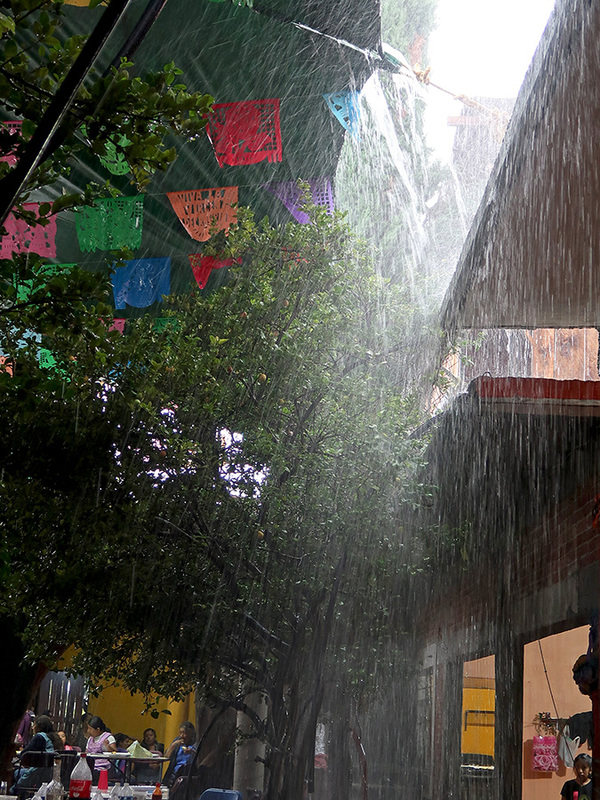 Last year’s encuentro was fabulously delicious! 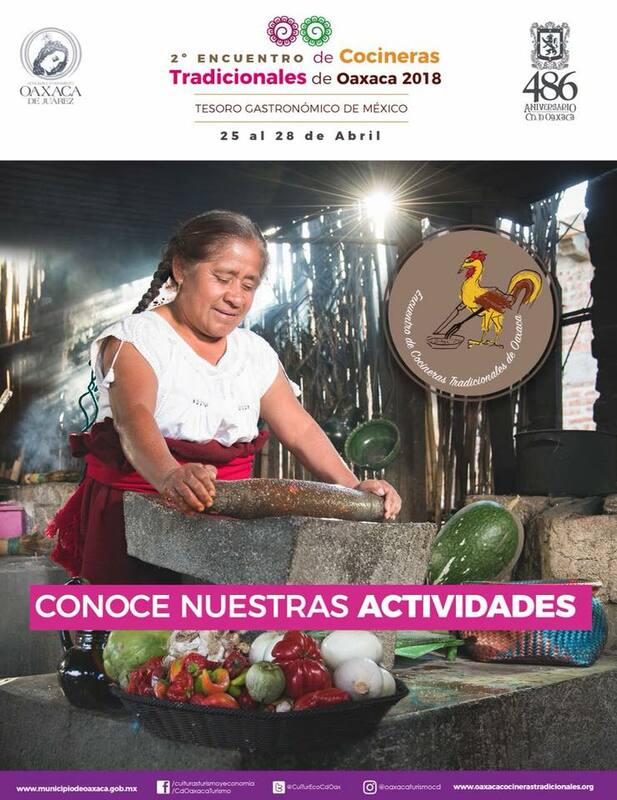 If you are in Oaxaca or can find a way to schedule a last-minute trip here, I highly recommend attending this year’s Encuentro de Cocineras Tradicionales de Oaxaca. I’ll be there everyday and hope to see you.